Bloomington will now offer residents an opt-out water leak insurance program and opt-in water and sewer line policies. Bloomington residents will see an additional $1.05 on their monthly water bills as insurance against water leaks. The city council on Monday unanimously approved the new program which will provide up to $500 of annual coverage. Residents can opt-out of the policy at any time by calling ServLine, the policy vendor. The company offers a full refund on the monthly fees to those opting out up to one year after the program start. Those who choose to keep the water leak protection can also opt-in to add ServLine’s water and sewer line coverage at $4.84 a month and $6.60 a month, respectively. Both policies cover up to $10,000 of damage per incident. 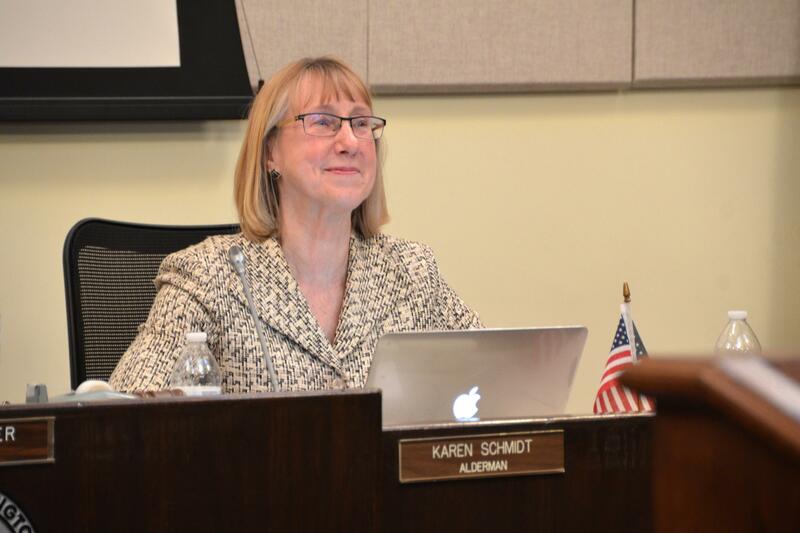 Alderman Karen Schmidt opposed the motion approving the opt-in programs. Council members voted 6-2 to approve the opt-in programs. Alderman Karen Schmidt opposed the motion. She said she began receiving more and more questions from residents as the date to consider the policies grew closer. “I think that there are still some misunderstandings and some questions that need to be answered that I wanted to make sure were part of the public record,” she said. Alderman David Sage cast the other opposing vote, taking issue with city practices codified—or not codified—in the public works department's policies. Public Works Director Jim Karch said while city code says homeowners are responsible for their lateral service lines up to and including the main line connection, the city’s practice has been to take responsibility for repairs in cases where the damage impacts streets and sidewalks. Sage worried without putting that practice on paper, the city in effect transfers the risk to residents opting out of the service line coverage. “So if people opt out, then the city will continue the practice of repairing those laterals that are on city property?” Sage asked. Karch said that would be the case in emergency situations. Alderman Scott Black voted to add the coverage options, but said the discussion between Sage and Karch made clear the city needs to revisit the issue at a policy level. The council also approved a new plan to solicit public input on how the city spends Community Development Block Grant money. Bloomington typically gets about $500,000 each year through the program, administered by the U.S. Department of Housing and Urban Development and overseen by the city’s community development department. Housing and rehabilitation projects historically receive the largest portion of funds. Three residents shared their thoughts on how the city might spend CDBG money to address homelessness, create affordable housing and add recreation opportunities. "This is the cart we need to put before the horse." Toney explained the plan passed Monday night is not about deciding how to spend those funds. Bloomington worked the Town of Normal and the McLean County Regional Planning Commission to develop the plan, which Normal adopted last week. It’s all part of preparations to plan for the 2020 five-year consolidated plan the city will need to submit to HUD for approval—a process that won’t formally begin until early 2019. “This is the cart we need to put before the horse,” Toney added. The plan calls for additional public meetings, focus groups and surveys, with guidelines for giving all residents equal access to participate. In 2009, Bloomington and Normal issued proclamations designating March 8 as Frank L. McSwain Sr. Day in the Twin Cities. Now the late Reverend will be honored with another date bearing his name. Dec. 8 will now be recognized as Rev. Frank McSwain Sr. Remembrance Day in Bloomington. Mayor Tari Renner presented the city proclamation to a crowd of the late reverend’s friends and family gathered in the council chambers Monday night. The longtime pastor of Mt. Pisgah Baptist Church died Dec. 6 following a lengthy illness. He was 64. Renner called the commemoration a celebration of McSwain’s life and his contributions to social justice in the community and beyond. McSwain was involved in the local Not In Our Town movement, the Bloomington-Normal chapter of The National Association for the Advancement of Colored People, the Family Community Resource Center, and several other organizations and initiatives. That’s what the city and the world needs more of, now more than ever, he said. GLT's interview with Bloomington Mayor Tari Renner. A pastor who served his west Bloomington church for 35 years is being remembered as a dynamic, kind-hearted man who helped many people far beyond the churches walls.